It’s been quite some time since I’ve been able to fall asleep without cleanly washed hair (yes, I guess I was quite a grimy kid). But now my ability to live with my greasy roots and flat hair the day after has been tested again! Just went for a minor operation which required stitches on my scalp and in preparation, I finally got myself some dry shampoo that I’ve been meaning to try but never felt the need for since I wash my hair everyday. 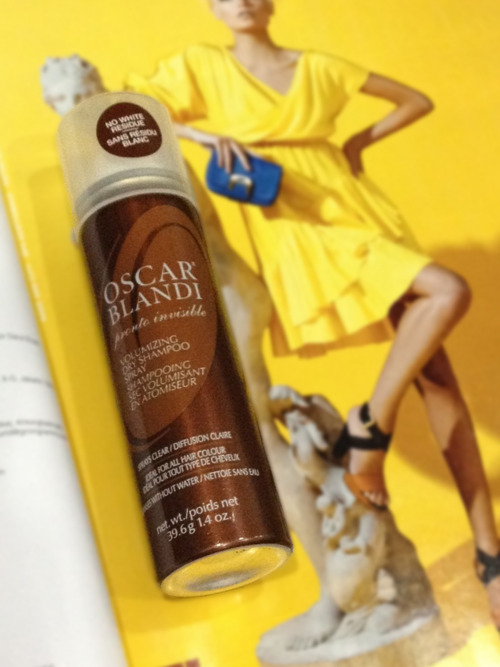 Introducing my new found friend – Volumnizing Dry Shampoo Spray by Oscar Blandi. This dry shampoo spray is lemony and smells uber fresh. It doesn’t leave white residue like some other dry shampoos, which is awesome since my hair is dark. p/s for those in Singapore, you can find this at Sephora – S$19 for a 1.4oz bottle.